Sequences of a few hundred images together with their trigger times are stored Huffman-encoded in files called *.pictures. GPS data is preprocessed into a table of ASCII text. The format of both image and GPS files is not (yet) explained here. Cameras and GPS system need to be calibrated, which is not explained here. 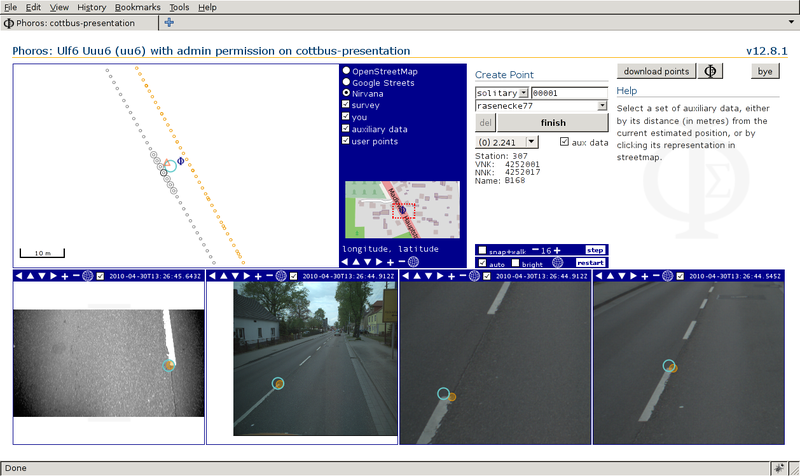 GPS data and image information are fed into the database using option --store-images-and-points of the Command Line Interface. emits a rather comprehensive help message. A user can than point their browser at Phoros's URL. Example: http://localhost:8080/phoros/beautiful-cities connects to presentation project beautiful-cities (and asks for username and password). In the map, small yellow circles represent points of view of the available images. Pointing into an area of interest has Phoros select and display a few1 images containing the point clicked, which on the streetmap is represented by the dark blue Phoros logo. After zooming into a first image and selecting a feature of interest, epipolar lines appear in the other images which may be helpful in recognising the selected feature there. Points selected in images are represented by large yellow circles. Zooming in and selecting the same feature in a second image triggers calculation of the estimated global position. The estimated position is now shown as a cyan circle in all images and in the map. Neither estimated position accuracy nor pointing precision are bounded by pixel size. Zooming in and pointing at the feature in some (or all) of the remaining images improves accuracy. Finishing this point means storing it in a dedicated user point table. Browse Phoros source code via gitweb at Github. Browse source code of Steffen Scheller's PhoML library, which is needed by Phoros. The build process isn't perfect yet. You'll (probably) need an x86-64 Debian system with Quicklisp installed on top of SBCL. Install Debian; choose standard system tools and (probably) SSH server. Install Debian packages ed, emacs, fonts-sil-gentium, g++, git, icoutils, imagemagick, proj-bin, sbcl, sbcl-source, slime, swig. Peruse the example scripts and the help message to learn about Phoros administration. For use with firefox from fasttrack, set in about:config browser.link.opennewwindow.override.external to 1. Phoros is implemented using Steel Bank Common Lisp, a Common Lisp implementation. Communication with PostgreSQL is provided by Postmodern. The presentation server is based on Hunchentoot. Almost everything visible in the web browser looks as it does thanks to the OpenLayers library, interfaced by Parenscript and CL-JSON. Without Steffen Scheller's photogrammetric library PhoML Phoros's presentation server couldn't do much beyond displaying geolocated images. Once decoded, images are turned into something a web browser can handle by ZPNG. Leap second information is taken from the Earth Orientation Center.